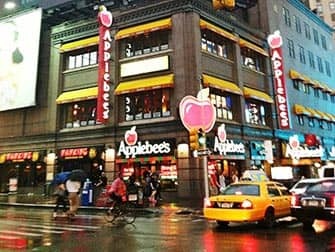 There are many restaurants in New York for kids. What’s great is that there are a few things that make it a lot easier than in Australia. In New York, for example, it’s very common to only order an appetizer, or to ask for an extra set of plates and cutlery, so you can share your meal. The pizzas in particular tend to be large enough to share. Another nice option is to take a boat tour with dinner buffet. This is a nice break, and the buffet system is ideal for children as they can choose exactly what they like to eat! There are a few other things to consider; making a reservation for example, is often not possible. This means that it is quite normal to have to wait outside before you can be seated. Maybe that is not too big of a problem for you, but does your child still fancy a nice dinner after waiting for half an hour to an hour? Restaurant chains sometimes have chairs outside, but smaller restaurants do not. The only tip I can give to help prevent you from waiting, is to make sure that you are at the restaurant before the clock strikes six. This way you are ahead of the musical-visiting crowds, whom – especially in Midtown – flood the restaurants from six o’clock onwards. Being a parent, I would not hastily recommend going to fancy restaurants with a baby. Formal restaurants are small, cramped and often don’t have space for a pram. 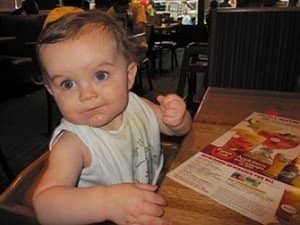 If the baby is old enough to sit on your lap, or a highchair is available – which is rather unusual – then it might be possible to arrange something. Keep in mind though, how you would feel when your child – of course this never usually happens – starts screaming hysterically. Also bear in mind that in these kinds of restaurants they almost never have space to change nappies. The bigger chain restaurants are a better option in that case. These establishments are often spacious, have room to place your pram next to the table and make you and your offspring feel welcome with highchairs and kids’ menus. 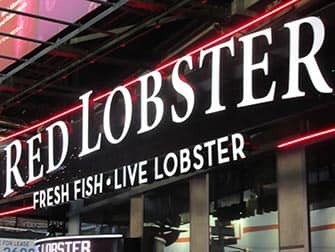 Examples of these chains are Friday’s, Dallas BBQ, Applebee’s, Olive Garden and Red Lobster. Children within this age group especially like eating out where there is a smashing experience involved. 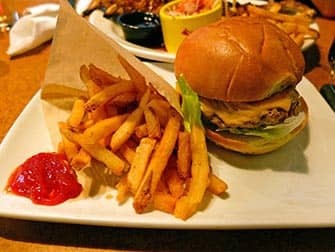 At Dave & Buster (42nd Street) they can go wild in the game zone, and at Bubba Gump Shrimp Co – a Forrest Gump themed restaurant, on Times Square is quite an experience in itself, particularly fun if the kids have seen the movie. 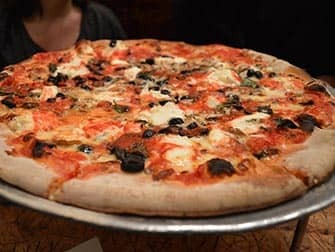 This age group tends to be really happy about having burgers and pizzas for dinner of which there is an abundance in New York. Great places to eat with adolescents are for example 5 Napkin Burger, John’s Pizzeria and Lombardi’s Pizza. Does your child crave Pizza again but you want more variety? Try Carmine’s – an Italian family restaurant serving seafood platters, meat dishes and, of course, Antipasto. Everything is made to share. This way, your child can explore new flavours he/she might not have discovered yet, without immediately leaving a whole plate untouched if he/she doesn’t like it. Is your child a young adult already? Then it’s nice for them to experience one of the more ‘fancy’ restaurants. However, contrary to what they might be accustomed to in Australia, in New York young adults (under 21) can’t go out or even enter a bar without being accompanied by an adult (someone over 21). Supernova on the first floor of the Novotel is a nice spot, with the view of Times Square and the option to eat outside. On Fridays events are organised on the roof. Other restaurants that might be a good option are steakhouse STK, The Standard Grill and Robert NYC. Eric’s Tip: Be inspired by the tips above, but do go explore on your own. It is marvellous to discover new restaurants by yourself. Each week ten new ones pop up!